We’re living in a time when groups who consider themselves “nations without states” are making bold moves for independence. And the recent news of the Catalan government pushing to separate from Spain, along with Madrid’s harsh response, has taken many by surprise. The big question for many: Is it safe to travel in Barcelona and the rest of Catalonia right now? Statistically, I’d say yes — especially compared to the risks people take when traveling around the USA. But that’s a personal decision each traveler needs to make. If you can’t be relaxed — even in a place that is, by any rational measure, plenty safe — it’s not much of a vacation. For many Americans, their dream destination is La-La Land. (The only guidebook that outsells my bestsellers is for Disney World.) And if you want La-La Land, go for it. But I believe in encouraging Americans to venture beyond Orlando and enjoy a firsthand look at the fascinating realities playing out beyond our borders. Right now, personally, I’d jump at the opportunity to be in Barcelona — to feel the energy and frustration sloshing around its streets, to talk to people, and to witness history unfolding. But that’s a personal call. I’ve been in many places much more volatile than Barcelona is right now (from Moscow to Sri Lanka, Nicaragua to Egypt, Tijuana to Palestine)…and have always been thankful for the experience. If you are traveling to Catalonia soon, it’s important to stay informed. Follow the news carefully, and steer clear of areas where protests are taking place. Keep a close eye on the US State Department’s travel alerts and warnings. And, for a second opinion, I also like to monitor the United Kingdom’s Foreign Travel Advice. When in doubt about whether a particular area or gathering is safe, err on the side of caution. As for the future of Catalonia — who knows? I remember a time — in the 1970s, under Franco — when the very idea of “Catalonia” was prohibited. The Catalan language, flag, and other cultural symbols were illegal. But the demise of Franco and the arrival of democracy brought a surge in Catalan patriotism. 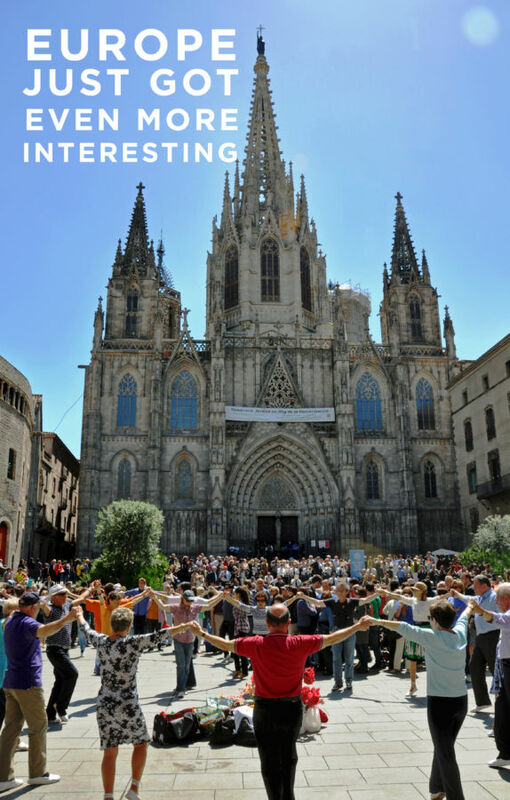 These days, everyone gathers in front of the Barcelona cathedral each Sunday morning to dance the treasured Sardana (once outlawed by Franco), kids learn and speak the Catalan language first, and everywhere you go, you’ll see the proud red-and-yellow stripes of the Catalan flag. An EU parliamentarian might use the recent news from Catalonia as a concrete example of why Europe supports ethnic regions rather than political borders. When you look at turmoil across the globe, much of it is because, long ago, powerful states drew political borders with no regard to small ethnic groups. Had the Catalan nation been respected when the line between France and Spain was drawn, things would be different today. As with the Scots in the UK, the Kurds in Turkey, the Russians in eastern Ukraine, and other minority groups across Europe, many Catalans believe that now is the time for more autonomy. What’s happening between Spain and Catalonia is another vivid reminder that Europe is a dynamic organism. While Europeans are enjoying an era of unprecedented peace and cooperation, contemporary politics still come with plenty of conflict. Learning about history as it unfolds is part of the joy of travel — whether it’s chatting with Brits in a pub just after Brexit, commiserating with Greeks about their economic struggles, or rubbing elbows with Catalans as they’re facing a moment of truth about how far they’ll go in pursuit of independence. We live in interesting times. And, as things get more and more interesting, you have a big choice to make: La-La Land…or reality — Orlando or Barcelona. Happy travels!